Discover Anna Maria Island Lodging options....resort, motel, B&B, and beach rentals....for your Florida getaways and girlfriend getaways. Anna Maria Island is unique in that you will NOT find high rise hotels holding great numbers of people. This is one of the charms of this beautiful "hidden gem" and what makes the island, which includes Bradenton Beach, such a great Getaway in Florida. There are strict building codes to sustain the unique intimate feel of the Island. For this reason, if you are looking strictly for Anna Maria Hotels, you will have to have to stay in Bradenton, which is quite close. You could also consider the Harrington House B&B (information below). 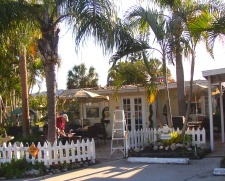 There is one B&B Anna Maria Island. This would be a great spot for a Florida girls weekend or any girls getaway. It is a nice central location on beautiful Holmes Beach within easy walking distance of many shops and restaurants. Comfortable and roomy apartments, bungalows and suites have space for families. Practically all have kitchen facilities which mean you can cook some or all of your meals (great for kids that are "picky eaters").....and you save a lot of money! Heated pools are PERFECT entertainment for kids (and they sleep great!! )....and you will save money avoiding theme park entrances,etc. Unique Anna Maria Island Lodging ...on a Sailboat! If you would like to try something different, check out these unique Anna Maria accommodations ....a beach vacation on a sailboat! This "Boat and Breakfast" has 3 bedrooms and is docked at Bradenton Beach village on Anna Maria. It even includes a harbor tour in a dinghy :) Details and check availability. For your rental vacation Florida, check out Anna Maria Island Beach Rentals. Directly on beach, 1 and 2 bedroom apartments, heated pool, near fishing pier and "cafe on the Beach"
On the beach, 1 and 2 bedroom apartments, efficiency units and cottages. Individually decorated 1 and 2 bedroom apartments, on beach, heated pool. Suites and apartments, on the beach, heated pool, daily maid service, and shuffleboard. Grand Penthouse Suites, Cabanas and Cottages, on the beach. Tropical landscape, 1 and 2 bedroom villas, 3 minute stroll to beach, laundry and pool. Cottages, heated pool, steps from the beach, bikes, laundry. 16 suites with Asian feel, on quiet residential street, exotic gardens, heated pool. 50's style motel, original and renovated rooms, studios, and 1, 2, and 3 bedroom apartments - all with kitchens, short walk to beach, heated pool, laundry, and free bikes. Pets welcome! I hope these excellent lodging choices help you plan your beach vacations or girls getaways on beautiful AMI!